By	Marios Alexandrou on November 7, 2018. With every other trip I've taken I haven't had to worry too much about staying within the luggage size and weight limits. Which isn't to say that I'm a particularly compact packer, but it seems the typical requirements are pretty generous even with all of my camera gear and other electronics. However, packing for my safari trip to Botswana and Zimbabwe proved to be rather challenging. The first step was figuring out the maximum dimensions for my bag and then finding a bag that fit. Based on the documentation, it looked like a duffel bag would be the most appropriate choice — soft sides so it can be packed more easily in the charter plane's cargo hold (the sort that you'd typically use to get to the safari camps) and carried by hand since I already have a backpack. 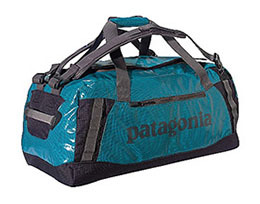 I settled on the Patagonia Black Hole Duffel with dimensions 11x13x24 and 60L capacity. Aside from (mostly) meeting the size limits, this bag is made of waterproof fabric, has water resistant zippers, and a couple of carrying options including straps that turn it into a makeshift backpack. The one negative is that I picked the aquamarine one which turned out to be a brighter blue than I expected — I was kind of hoping to not attract extra attention while on my trip! Next up was figuring out how much my gear was going to weigh. To do this I did a rough pack of the bag, not really caring where things went or even if I could close the main zipper. Checking out the weight was easy enough — weigh myself with the bag and compare that to my weight without the bag. Sure enough I exceeded the 20lbs limit. And then the fun began… I scaled back on the number of clothing items I packed, I took out my jacket to carry in my hand, I reduced the number of spare batteries, and I gave up one of the books I had planned to read. With these changes the weight dropped to about 19 lbs. I admit it. I'm one of those types that likes to put things in Ziploc bags. And you better believe I used them when packing for Africa. Not only would these bags afford extra protection from water and dust, but I figured they'd also be good for keeping bugs away from stuff and making for a less than pleasant surprise in the morning! From an organizational perspective, I put related items together in the same Ziploc bag. For example, items I'd be wearing to bed went into the same bag so that I wouldn't have to open multiple bags necessarily. I found the quart, gallon, and 2.5 gallon sizes to offer the best packing options. And of course I packed extra bags just in case. With weight and size limits I needed to hit, it was even more important for this safari trip than any other that I find travel-sized items — shaving foam, soap, shampoo, toothpaste, Kleenex, and contact lens solution. This wasn't too hard of an effort, but I did put some time into locating fragrance free products hoping that such products would be less likely to attract annoying bugs while I was out in the bush. In my case, there wasn't much for me to do with my carry-on bag. That's because 80% of the space was taken up by camera gear. So a snack, book, ID, flashlight, and a change of clothes is pretty much all I packed aside from camera stuff. I spent about 2 weeks on this packing effort. Not that I was packing every day or anything crazy like that. Instead, I'd pack, go shopping to pick up what I missed, and then re-pack. I'd forget about it for a day or two and then be inspired to add an item or two. On the weekend I'd do another weight check to assess the impact of the new items I added and then I'd need to tweak things. In the end, all was good and I'm actually impressed that I was able to pack so compactly. This could be a new way of packing for me!